Relay Output - Normally open or normally closed. Max rating 30 V 50 mA. 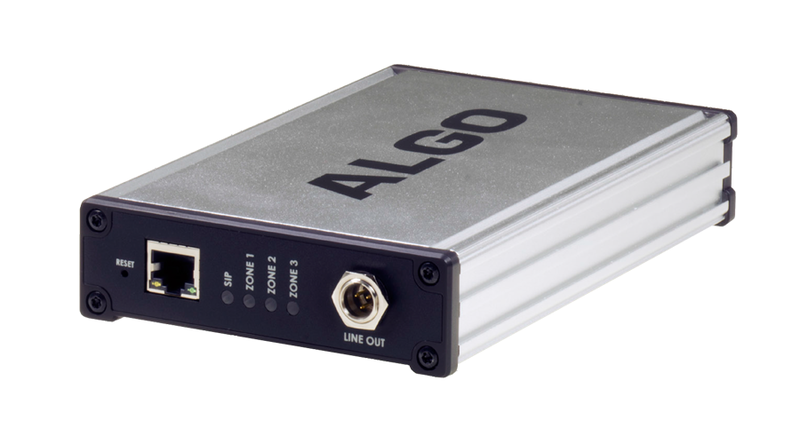 The 8373 is a PoE IP Paging Adapter for integrating existing and traditional zoned paging solutions into a VoIP environment, whether premise or hosted. Features include G.722 wideband support with isolated and balanced line output for optimum clarity and intelligibility without hum or noise. 7 Page extensions map to possible zone permutations + 1 page extension for keypad zone control + 1 extension for notification. Transmit or receive using multicast IP address mapped to paging zone(s). G.711 A-law, G.711 u-law, G.722, Polycom Group Page, OGG Vorbis (other codec support available on request). 10 dBm / 0 dBm / +4 dBu. Transformer isolated internally. Male mini-XLR connector and pluggable terminal block. Frequency response 100-7000 Hz +/- 3dB. Customizable. Includes chime, gong, bell, warble, barking dogs. Live or cache and release. Based on SIP extension called, received multicast IP Address, or keypad events for 8373 configured as page SIP extension. Normally open or normally closed. Max rating 30 V 50 mA. Web interface (HTTP or HTTPS) or autoprovisioning server.